"Aatm yoga shala" the name of our school itself means "soul" , a place which will lead you to the path of self realization and create a strong connection to your soul and make you listen to your inner voice. Away from the fast pace life of limitless desires & expectations, here at the banks of Mother Ganga you will touch base with reality of the universal language of spirituality. Our school will help u establish a firm foundation for your self practice. The school will not only fulfill your expectations under the expertise of the teachers but also create a conducive environment for you to maintain and achieve stability and build stronger roots according to yogic disciple. The accomodation is provided keeping in mind the comfort and space for a individual to feel at home. 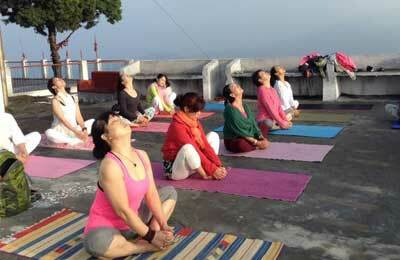 The school aims at providing an enriching yogic experience. Inspite of Rishikesh having more than a 100 yoga schools our shala can be differentiated by the years of experience & personal touch the teachers of our school give to each student. They make sure that every student gains what they intend to achieve throughout their one month journey. The classes are designed keeping in mind the specific aspects of yoga roots through lectures and yoga asanas.